With the creation and development of the European Union, an authentic ideology of convergence of political culture and behaviors took shape and empowered or justified politics of the “fait accompli”. The vision of lock-in effects of political integration optimistically envisaged the emergence of a post-national cosmopolitan spread of values through the complex mechanism of Europeanization as norms diffusion process. Yet the normative integration inside the EU generated political and identitarian asymmetries, claims on the power of naming what is central and peripheral to European identity, and inclusion/exclusion nexuses. 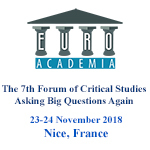 Recent times have emphasized the fragility of European convergence with the re-emergence of centripetal nationalist, anti-Europeanist and new far right movements and parties that re-assert the importance of fundamental questions regarding the nature of the EU and the efficiency of European integration outside Pareto efficiency standards. This paper argues that the EU’s overenchantment with the achievements of integration and persistence in limited democratic politics with functional hierarchies and club-based priorities, facilitates the re-installment of a heteronomous divergence of national opportunist politics, re-emergence of old uncritical visions and social fears. Europe still needs to foster its own imaginary social significations as autonomy understood in the sense of Cornelius Castoriadis to be an unlimited critical questioning of existing norms and values in order to facilitate an authentic deliberative sphere and the formation of new European imaginary significations that go beyond old national(ist) habits.